Coolgear's new 22W Type-C power delivery adapter for PoE allows any iPad series of devices to connect to a power source over long distance. Using Type-C to deliver power to your devices over a Cat 5, Cat 5e, Cat 6, Cat 6a. 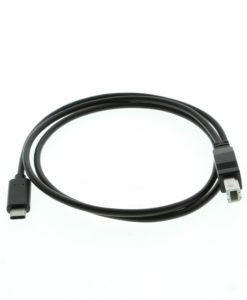 STP or UTP cable (over Ethernet) can extend your connected distance and eliminate the need to stock power adapters. 22W power adapter connected to a PoE splitter. New and old USB power over Ethernet USB device adapter, complied to USB PD specification rev. 2.0. Type-C 22W output power adapter provides on demand power to new Type C power delivery enabled devices such as; Apple/HP/Asus/Samsung and many more new type C PD gadgets like EEro’s, Nest Camera etc., as well as legacy Type A devices that require fast charge or QC3.0 power. The CGL-UCPA22W can power your iPad, iPad Pro, iPad Mini, iPad Air, and iPad Touch via simple power over Ethernet splitter (not included) and then provide power to the USB port. There is no need to plug in your iPad device to AC power adapter; power is sent over the Ethernet cable. Easily place any USB Type C device by just adding a PoE switch and pulling cat5 to your device locations.